Extensive English reading (reading a lot) is one of the best ways to increase your vocabulary and fluency. The best way to motivate yourself to read a lot in English is to find readings that you can enjoy. It's good to read selections that exercise your mind, but don't choose readings that are too hard. It's important to understand what you're reading without stopping too often to look up words. 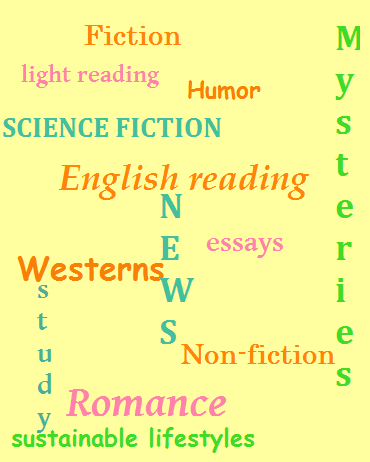 There are many places you can find English reading materials to match your interests and reading level. If you read English at a beginning or low intermediate level, there are suggestions for those readings in Easy Reading for ESL Beginners. The rest of this page has suggestions for high intermediate or advanced-level readings. Studying similar information in several different sources will reinforce the vocabulary you are learning, as some of the same words are used repeatedly. Research shows people usually need to see or hear a word six or more times to really learn it. Reading it in different contexts also teaches you more about its connotations (the feelings it implies) and the different ways it can be used. To reinforce the vocabulary even more, write a little about what you have read, or talk about it with a friend. You might even start a book club. When several friends read the same English-language book or article, you can have very interesting discussions. Reading a book in another language can be a major project. That's why I suggest a few exceptional children’s or young adult books even if you read English at a high intermediate or advanced level. Most libraries have a collection of YA (young adult) books that are medium length and high interest whether you are in your teens, 20s, 30s, or above. You can read several short children's or young adult books in the time it would take to read one adult book. In accuracy, imagination, characters, and plot they often equal the best adult books on similar topics. Books that have won the Caldecott (picture books) and Newberry awards are some of the best-of-the-best of American children’s books. All the Caldecott books I mention on the Easy Reading for ESL Beginners page (with the link above) are worth considering for yourself, as well as for reading to your children (if you have any). and my personal favorite (a science fiction/fantasy) A Wrinkle in Time and its sequels by Madeline L’Engle. The Little House on the Prairie and its sequels by Laura Ingalls Wilder bring to life pioneer self-sufficiency in a harsh environment. There are many great English children’s classics including Treasure Island by Robert Louis Stevenson, The Secret Garden by Frances Hodgson Burnett, and The Chronicles of Narnia by C.S. Lewis. You can also read reviews (or order these books) online. Ask a librarian for other recommendations. There are some shorter, high interest stories, as well as books set in many different cultures, countries, and time periods. A library has many levels and types of English reading materials-- something for everyone! Some of the best books being written are aimed at teen and young adult readers. Talk to a librarian about your interests, and he or she will be able to show you fascinating books on almost any subject. For ideas for many high interest, not-too-difficult teen or young adult books on various subjects see also the themed booklists on the Adlit site. They have about forty different lists, each with short descriptions for a number of excellent but not difficult books on that theme. There is a world of knowledge and interest awaiting you in books written for adults, as well. I'm just going to suggest a few authors of classic "light" (recreational) English reading, based on my experience working in a California public library for almost 10 years. Do consider looking at the children's and teen lists, as well. Many of those stories are classics, of high-interest to thinking readers of any age. In addition, they are shorter, so you can enjoy them even if reading in English is difficult and slow for you. For non-fiction, more recent selections, or current bestsellers, talk to a librarian (who can also help you match your personal interests). You can also look at the New York Times Book Review, listing and discussing the best in current American fiction and non-fiction. Adult fiction classics you might start with include To Kill A Mockingbird by Harper Lee and Animal Farm by George Orwell. For westerns, try books by Louis L’Amour or Zane Grey. For humor, try Three men in a boat by Jerome K. Jerome (a classic), or books or essays by James Thurber, P.G. Wodehouse, or Mark Twain. (Humor in a different language and from another culture can be difficult to understand or appreciate fully. It often relies on subtle language differences or on a very complete understanding of cultural values. For romance, you might start with books by Norah Roberts, Mary Stewart, Catherine Cookson, or Victoria Holt. For suspense, try John Grisham, Tom Clancy, Mary Higgins Clark, Robin Cook, Michael Crichton, or Ken Follett. For mysteries, besides classic authors like Sir Arthur Conan Doyle (Sherlock Holmes) and Agatha Christie, you might try John D. McDonald, Dorothy Sayers, or Ellis Peters. Robert Van Gulik’s Judge Dee, an ancient Chinese magistrate based on Chinese literature. For finding English reading materials online, see Online Reading. Home> ESL Reading Hints> Finding English Reading Materials.